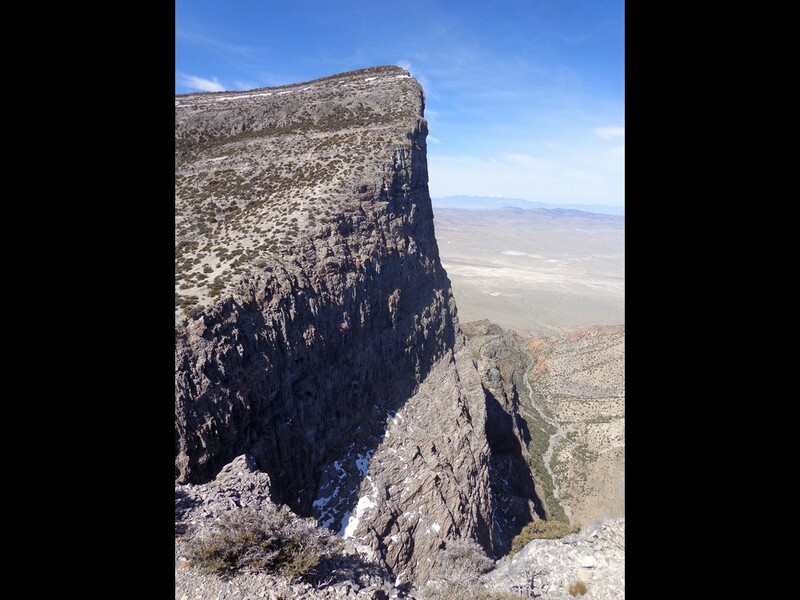 Notch Peak is located in west central Utah’s House Range, in the west desert not far from the Nevada border. The west side of Notch Peak boasts a vertical cliff of 2200’, which is arguably the highest cliff in North America outside of Yosemite. The cliff face is amazing, but Notch Peak has much more to offer. The Sawtooth Canyon approach from the east provides an enjoyable hike through really interesting desert canyon terrain. After a great day hiking Zion’s West Rim trail, I made the drive north toward Notch Peak mostly in the dark. I was in a low clearance vehicle and eventually got stopped by a rocky and rutted hill on the road about 1.5 miles from the “official” trailhead. Fortunately there was flat ground nearby, so I set up the tent and hit the sack after midnight. I slept in the next morning, and didn’t start hiking until nearly 8am. The first mile and a half of road made for a good warmup, then I started hiking along the trail. After less than 10 minutes after the trailhead sign, I found the trail fork heading left to the south fork of Sawtooth Canyon. It was pretty well marked. Soon enough, I was making my way up the canyon, which was really neat. 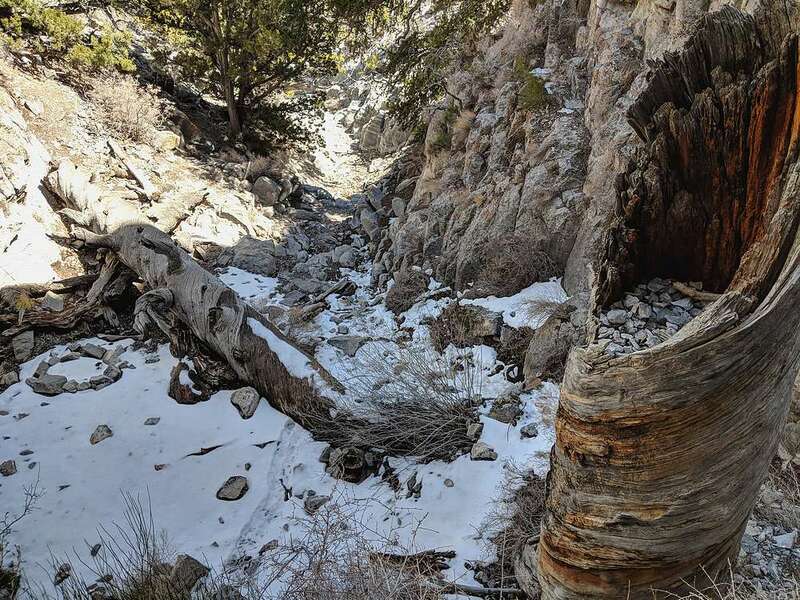 The route wound its way to the west, with a few narrow spots along the way, and some really interesting desert plant life and ancient juniper snags. Higher up, there were a few short scramble sections that made things interesting. 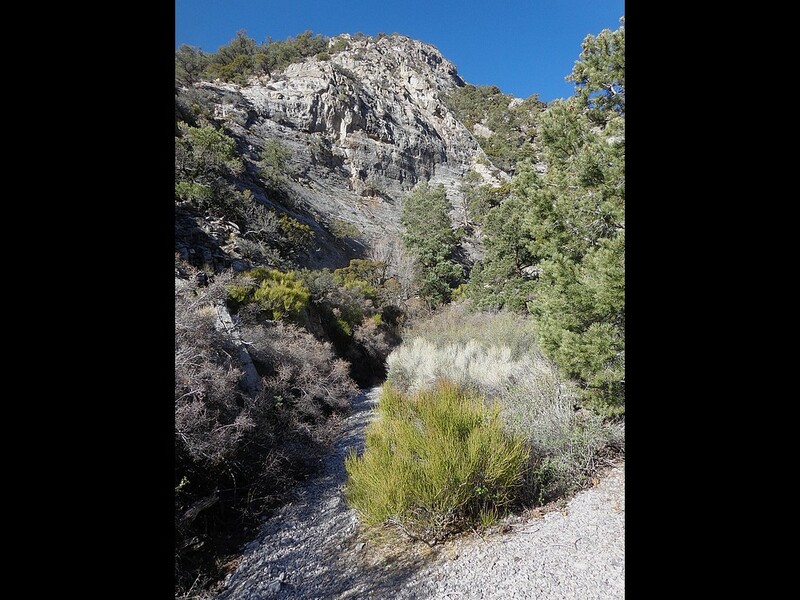 Soon after the canyon curved to the north, it came to an end and I found myself wandering up sagebrush slopes to the saddle due east of Notch Peak. From here I had my first view of the massive cliff face on the north side of the peak. Wow! The slope was a little steeper from the saddle to the summit, but no serious obstacles. Once on the summit of Notch Peak, the first view over the edge made my stomach a little queasy. Not joking. So I kept my distance while taking in the views. But soon enough, I couldn’t resist taking another look. This time I laid down on my belly, and inched out toward the edge. The drop off was extreme! I tried to take some pictures, but they totally fail to capture the scale of the cliff face. After getting my fill of the summit views, I made my way back down. 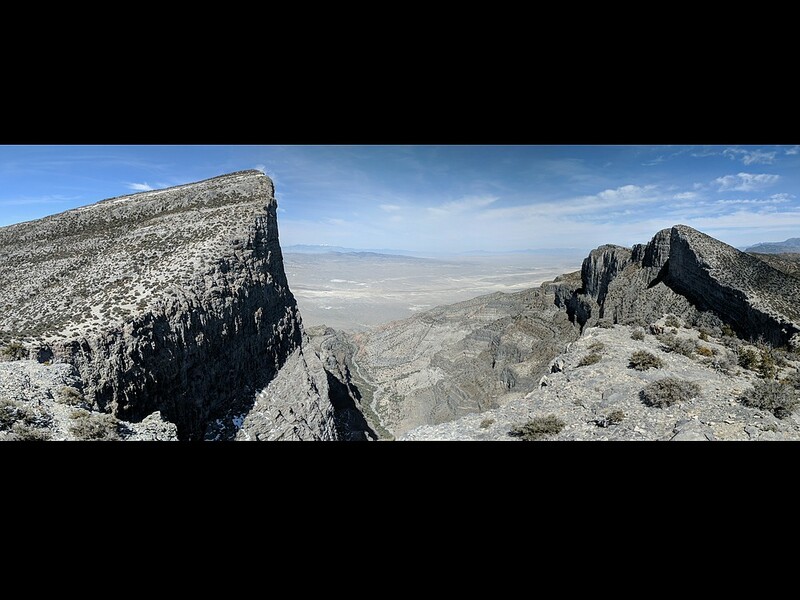 Just a brief detour to the point east of the summit to get better views of the cliff face, then retraced my path back down Sawtooth Canyon. The hike back was very nice as well, I really enjoyed the canyon and checking out various interesting trees along the way. Eventually I made it back to the trailhead, then hustled the last mile and a half back to my car. Round trip was just over 10 miles, 3300’ elevation gain, in 5.5 hours. 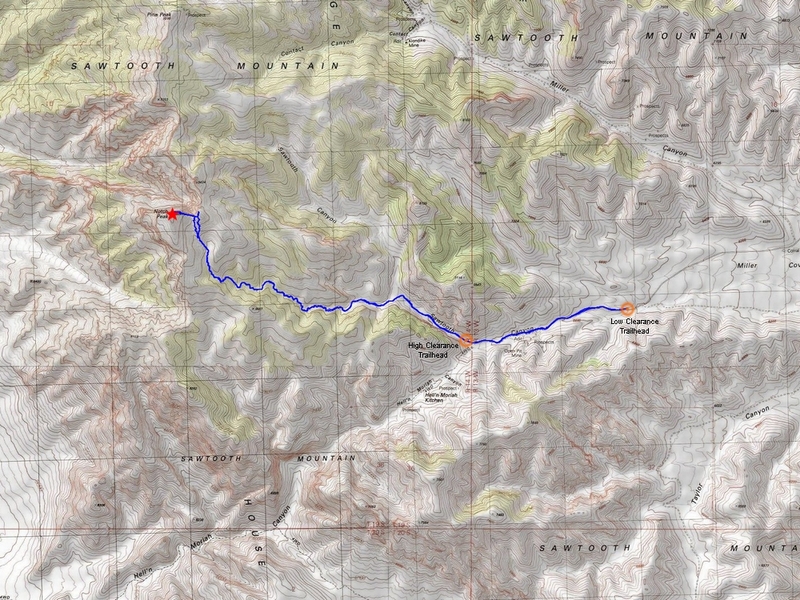 Map of the route, just over 10 miles and 3300' gain round trip. Some road hiking to start the morning. Beginning of Sawtooth Canyon trail. A narrow section of the canyon. Mormon Tea growing near the trail. 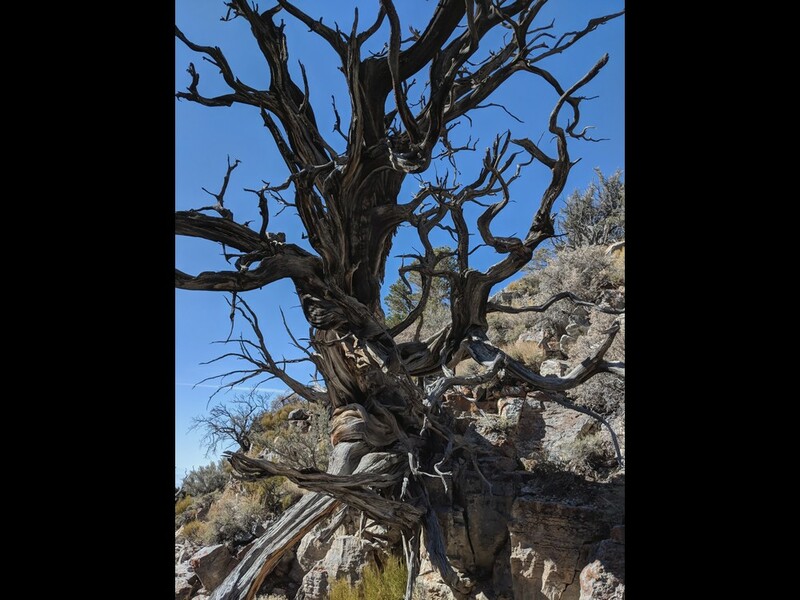 Lots of neat old juniper trees along the way. Twisted trunk filled with rocks that fell from above. 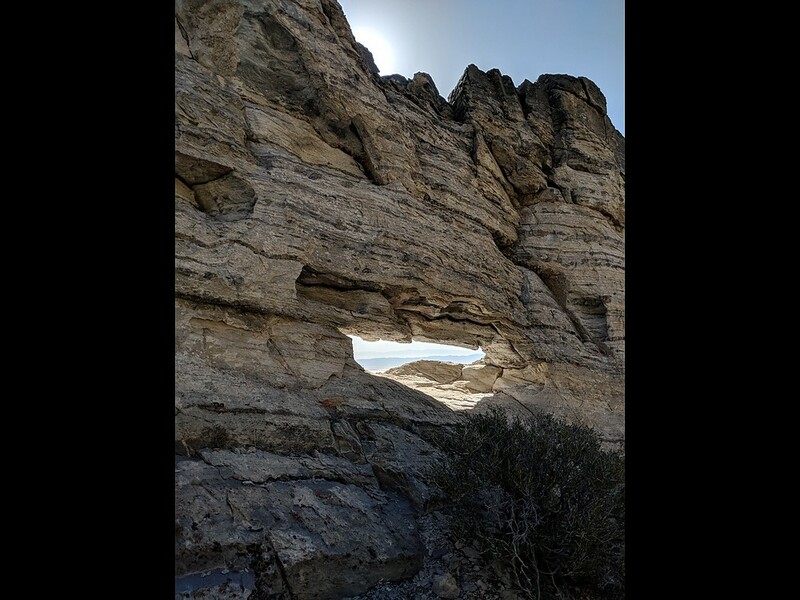 Natural limestone arch near the top of Sawtooth Canyon. Open slopes after leaving the canyon. Final stretch to the summit of Notch Peak. Me on the summit of Notch Peak. Looking over the cliff made my stomach queasy. Looking back on Notch Peak from the point to the east. Hiking back down Sawtooth Canyon. Final view of the Sawtooth Canyon trail. Notch Peak from the west during the drive home. Map of the route, just over 10 miles and 3300' gain round trip.Some road hiking to start the morning.Notch Peak trailhead.Beginning of Sawtooth Canyon trail.A narrow section of the canyon.Mormon Tea growing near the trail.Lots of neat old juniper trees along the way.Very cool gnarly snag.Twisted trunk filled with rocks that fell from above.Natural limestone arch near the top of Sawtooth Canyon.Open slopes after leaving the canyon.Final stretch to the summit of Notch Peak.Notch Peak summit view.Me on the summit of Notch Peak.Looking over the cliff made my stomach queasy.Looking back on Notch Peak from the point to the east.Panoramic view of Notch Peak from the point to the east.Cool looking juniper tree.Hiking back down Sawtooth Canyon.Final view of the Sawtooth Canyon trail.Notch Peak from the west during the drive home.